Most of the matters, without some exceptions, expand with the increasing temperature. When you give heat to matters; speed of its particles increase and distance between them also increase which results in the increase of the volumes of matters. All expansions occurs in volume of the substance however, sometimes some of the dimensions of them expand more with respect to others. In this case we neglect the less expanded ones and assume expansion like linear expansion in long materials. Moreover, we take the expansion of plate as area expansion and finally we take the expansion in three dimensions as volume expansion. Inverse of the expansion is called contraction, generally when matters lost heat and their temperatures decrease they contract. Now we will learn which factors effect expansion. If the initial volumes, areas or lengths of the matters are big enough their expansions with the same temperature are also big. In other words, expansion or contraction is linearly proportional to the initial volume of the matter. Different matters have different atomic structure, thus distances between the atoms are also different. They give different reactions to the same amount of temperature changes. So, another factor effecting expansion is type of matter. Final factor that affects expansion is the amount of change in temperature. Larger the change in temperature results in larger the change in the volume of matter. Where; ∆V is the change in the volume, α is the coefficient of thermal expansion and ∆T is the change in the temperature of the matter. α= Coefficient of thermal expansion is equal to the change in the volume of a unit of mass under 10C change in temperature. We will examine this subject under three title, linear expansion, area expansion and volume expansion. Linear Expansion: Picture given below shows the linear expansion of metal rod. When it is heated, its length increases. Where; ∆L is the amount of change in the length of the rod, L0 is the initial length of the road, α is the coefficient of linear expansion and ∆T is the change in the temperature of the matter. Where; ∆S is the amount of change in the area of the plate, S0 is the initial area of the plate, 2α is the coefficient of area expansion and ∆T is the change in the temperature of the matter. Example: We cut a circular piece from the rectangular plate. Which ones of the processes given below can help us in passing through the circular piece from the hole? I. If we increase the temperatures of the plate and circular piece, expansion of the hole and the circular piece will be the same. Thus, this option can help us. II. If we decrease the temperature of the circular piece, it contracts and hole becomes larger than the piece. This option can also help us. III. If we decrease the temperatures of the plate and circular piece, hole and circular piece contract in same size. This process can also help us. 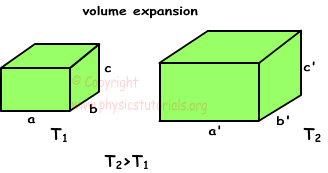 Where; ∆V is the amount of change in the volume of the cube, V0 is the initial volume of the cube, 3α is the coefficient of volume expansion and ∆T is the change in the temperature of the matter.